This service station sign features the vintage Texaco brand. The sign reads “Sky Chief Marine” at the top. 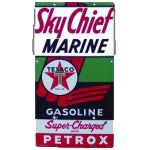 The Texaco logo is displayed below. Several lines of text at the bottom of the sign read, “Gasoline / Super Charged / with / Petrox. The sign is red, white, and green.